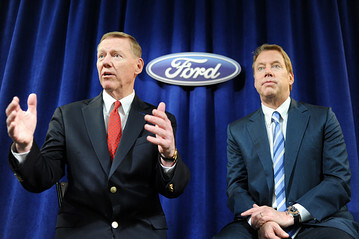 Ford Motor Co. CEO Alan Mulally, left, and chairman William Ford. Currently, Ford collects and aggregates data from the 4 million vehicles that use in-car sensing and remote app management software to create a virtuous cycle of information. The data allows Ford engineers to glean information on a range of issues, from how drivers are using their vehicles, to the driving environment, to electromagnetic forces affecting the vehicle, and feedback on other road conditions that could help them improve the quality, safety, fuel economy and emissions of the vehicle, according to Paul Mascarenas, chief technical officer of Ford Research and Innovation. “Improving quality is about building a database and really understanding how many people are using their vehicles and making better choices and better decisions,” he told CIO Journal.